Iron Bull Hoppers | Honeyville Metal, Inc.
Iron Bull Hoppers are a great addition to our Dust Collection Systems. We offer a 3 yard hopper as a standard size, which is approximately equivalent to 11 barrels. 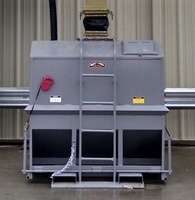 Contact us for information regarding additional hopper sizes. The hopper incorporates an easy, quick release tripping mechanism the operator can control from their seat. The uniquely designed hood provides for maximum capacity of the dumpster.